During the week I decided to take an F1 weekend off from Ipswich and Northampton, as Phoebe and Frankie JJ have a double header at Skegness. Besides, the mini truck is a lot cheaper to run than our blue one and Samantha can drive this one too. Thankfully there wasn’t too much damage from Stoke, so just routine checks, tyres and a good wash was required, which the kids are capable of doing anyway, so I spent most of week working on customers cars. We leave for Skegness Saturday morning at 12.30pm everything’s loaded, the amount of things you take never gets any less! Arrive at 3.30pm, the pits are already pretty full but we manged to squeeze in, and reading the programme we notice we are in for a long weekend as during both days there are 50 races! Phoebe and Frankie are in heats 2, 4 & 5, they are nearly always in the same heats which can make it difficult to watch them both. We always seem to miss something. Phoebe got spun out in 1st heat and retired to the infield, Frankie managed 11th. Phoebe came in and told me her brakes were sticking on so I soon fixed that. During her other races she got two 4ths and Frankie JJ got an 8th and a 9th. All good, no damage! Phoebe went out for her first heat but soon pulled onto infield. Back in the pits she explained that the engine was missing, and after a quick look I discovered that the dizzy cap had burnt out. Thankfully this is an easy and cheap problem to solve. Back out for Heat 2 and Phoebe won it!! Frankie JJ picked up couple decent places too. 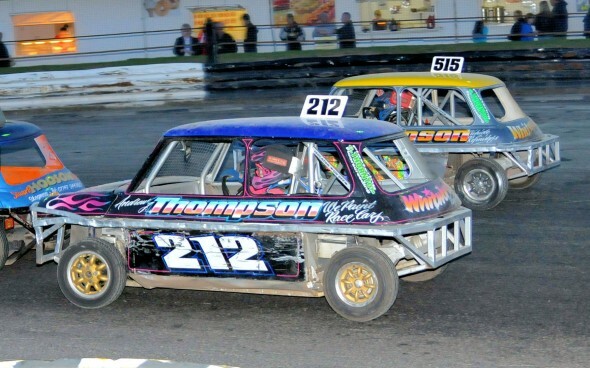 The main event (Skegness Open) was a closed grid race. Phoebe had qualified to start off 4th row outside and Frankie JJ 9th row outside, a reasonable start for both. Phoebe managed 4 laps but on the 5th was ‘put in’ – slight damage to car but Phoebe is okay. Frankie managed to keep going and come over the line in 9th place. So another racing weekend over! Cars and kids in one piece, all good!